One of the big issues the Fed's wrestling with is what constitutes neutral, and while there's a lot of false precision in the r* framework, by one popular measure the funds rate is already bang on neutral. 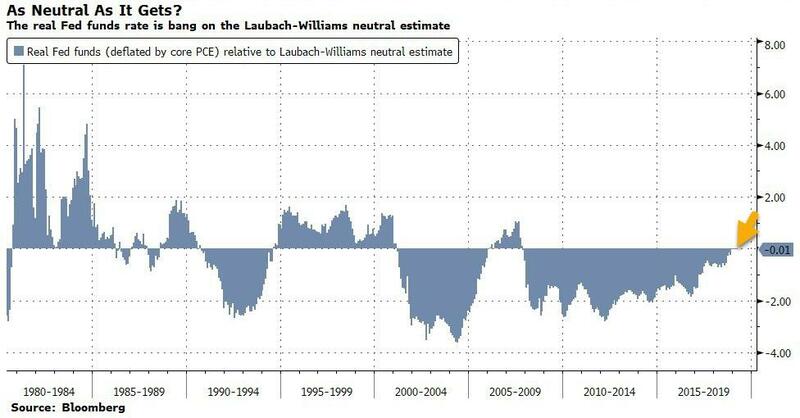 Bloomberg notes that if we compare the real policy rate (deflated by the core PCE price index) with the Laubach-Williams estimate of the real neutral rate, we find a perfect match. Expectations are that the FOMC will maintain its more dovish "patient" stance and shift from two hikes to one (zero would likely scare the markets) in 2019. Currently, there is a 73% chance that the Fed doesn't hike in 2019. This will be evident in the SEP with a lowered inflation and growth outlook. As of December, the Fed was anticipating 2.3% growth in 2019 and 2.0% in 2020. “The focus is going to be entirely on their dot plot and whether or not the Fed has taken any chance of a rate hike out of their own internal forecast,” said Lara Rhame, chief U.S. economist at FS Investments, which manages $24 billion. And, along with when to stop shrinking its asset portfolio, the Fed faces another decision - what mix of Treasurys it holds, with implications for the economy. Of course, The Fed's biggest issue is being perceived as dovish enough - the rates market is priced for 16bps of cuts... and how dovish is too dovish (what does Powell know that we don't?) and too hawkish risks a violent repricing in bonds and stocks which are expecting the Fed to be patient, data-dependent and on hold. As expected, Fed officials reaffirmed their commitment to being “patient” on future rate moves, while downgrading their assessment of the U.S. economy. 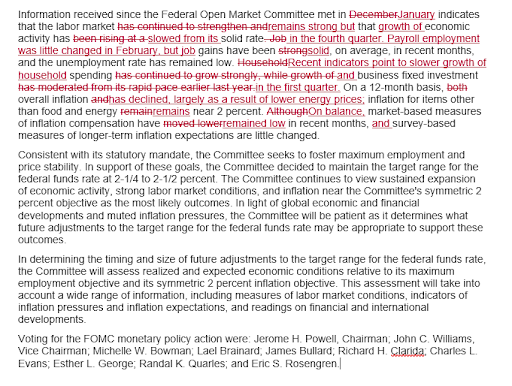 They left the fed funds rate target at 2.25%-2.50% and kept much of the statement relatively unchanged since January. ECONOMY: Policy makers now say economic activity has slowed from a solid rate in 4Q, say labor market remains strong; job gains still seen as strong on average amid low unemployment rate. Recent indicators point to "slower growth of household spending and business fixed investment in 1Q." End the securities portfolio unwind at end Sept '19. Taper the Treasury unwind by reducing the cap on monthly redemptions from the current level of $30 billion to $15 billion beginning in May '19. Reinvest maturing MBS across the UST curve, not towards the front end as some expected. Cap MBS redemptions at $20 bn/month, which would limit impact of a large pre-pay wave. Prepayments above this amount would be reinvested into MBS. Hold their aggregate securities holdings constant for a time and allow for a continued shrinking of reserves via non-reserve liability growth (i.e. currency in circulation). Additionally, The Fed plans to end balance sheet normalization in September. In light of its discussions at previous meetings and the progress in normalizing the size of the Federal Reserve's securities holdings and the level of reserves in the banking system, all participants agreed that it is appropriate at this time for the Committee to provide additional information regarding its plans for the size of its securities holdings and the transition to the longer-run operating regime. At its January meeting, the Committee stated that it intends to continue to implement monetary policy in a regime in which an ample supply of reserves ensures that control over the level of the federal funds rate and other short-term interest rates is exercised primarily through the setting of the Federal Reserve's administered rates and in which active management of the supply of reserves is not required. The Statement Regarding Monetary Policy Implementation and Balance Sheet Normalization released in January as well as the principles and plans listed below together revise and replace the Committee's earlier Policy Normalization Principles and Plans. To ensure a smooth transition to the longer-run level of reserves consistent with efficient and effective policy implementation, the Committee intends to slow the pace of the decline in reserves over coming quarters provided that the economy and money market conditions evolve about as expected. The Committee intends to conclude the reduction of its aggregate securities holdings in the System Open Market Account (SOMA) at the end of September 2019. The average level of reserves after the FOMC has concluded the reduction of its aggregate securities holdings at the end of September will likely still be somewhat above the level of reserves necessary to efficiently and effectively implement monetary policy. In that case, the Committee currently anticipates that it will likely hold the size of the SOMA portfolio roughly constant for a time. During such a period, persistent gradual increases in currency and other non-reserve liabilities would be accompanied by corresponding gradual declines in reserve balances to a level consistent with efficient and effective implementation of monetary policy. When the Committee judges that reserve balances have declined to this level, the SOMA portfolio will hold no more securities than necessary for efficient and effective policy implementation. 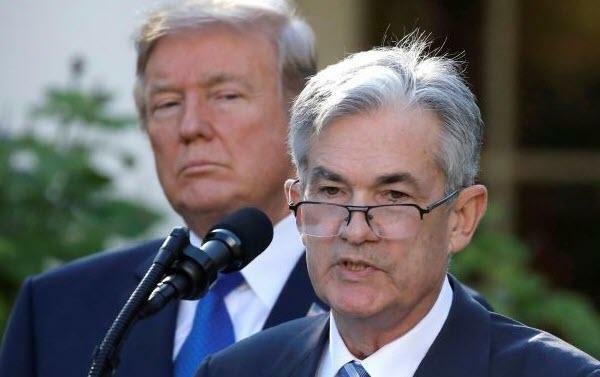 Once that point is reached, the Committee will begin increasing its securities holdings to keep pace with trend growth of the Federal Reserve's non-reserve liabilities and maintain an appropriate level of reserves in the system. Presumably, other than the growth downgrade, President Trump will be pleased?